Is Thursday the new Friday? When in the city, we almost always do happy hour on Thursday to catch up with coworkers after work. But when I'm in LA, I took the leisure to hit up Malibu to meet up with friends over brunch at the super cute Malibu farm! It feels extra special when we can do brunch on a Thursday! A subconscious thing for me is to go for an all-white outfit when I visit the beach. Today is no different. I chose this luxurious cashmere tank shell and paired it with a Cropped Wide Leg Sailor Pant and a 3/4 sleeve metallic knit jacket for a polished yet relaxed look. Spring in LA is CHILLY! This outfit combination provided me comfort and style. One rule I've religiously followed after turning 30 is to never sacrifice comfort for beauty. I need to feel comfortable in order to be my best self. The wide leg cropped pants provided me the flexibility to walk freely and run around on the sand. The cashmere tank top is soft and luxurious, it keeps warm. And the Metallic knit jacket is such a versatile and beautiful piece! The knits are SO delicate and well crafted. It's made with very subtle gold and silver threads and intertwined with pink chiffons. I think words failed me attempting to describe the craftsmanship. Visit a St.John boutique near you to take a closer look! After enjoying a relaxing day in Malibu, I headed to the new St.John boutique in Fashion Island, Newport Beach for their grand opening event. I was thrilled to be invited and celebrate this special occasion with St.John! I quickly changed into the dark orchid knit dress for the occasion and paired it with the same metallic jacket from the day. The dark orchid dress is structural and hugs every curve. The length of the dress is elegant and the bright color is a show stopper! It really brightens up my skin tone and made me feel special. 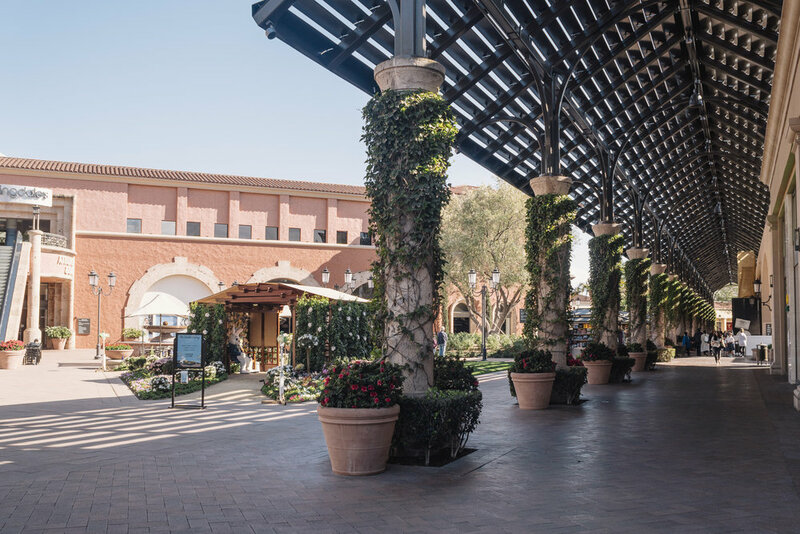 Interesting fact, Fashion Island is the first mall I visited after I came to the U.S. My parents live in Irvine and when I was little, Fashion Island the outdoor luxury mall was THE place to be! I remembered asking my parents to take me there every weekend if possible (yes, I liked shopping beginning from a very young age) It's different from most of the other indoor malls here in LA, Fashion Island is a lifestyle destination for the shopper who also enjoys nature, dining and shopping altogether. Needless to say, Fashion Island holds a very special place in my heart. When St. John invited me to their grand opening at their new boutique, I literally jumped and thought that's perfect! The store is very elegant and classic with an easy to navigate layout, sections are organized by colors. I also got to meet the Senior Vice President of Design, Greg Myler, enjoyed light bites, cocktails, a DJ set and informal modeling. I only hope Thursday like this can be on repeat!